Restored 1974 Suzuki GT380 Motorcycle. 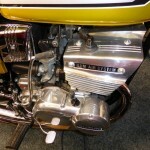 This lovely two stroke was restored by its owner. The fuel tank was stripped to bare metal and re-finished in the original Candy Gold. New “Glitter” side panel badges were fitted. New correct style tank badges were fitted. 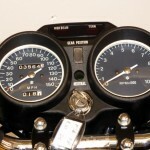 The speedo and tacho were replaced with new items from Germany. The frame and fittings were powder coated. 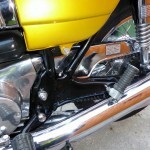 The wheels, handlebars and grab rail were re-chromed. 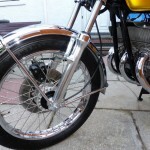 New stainless steel spokes were used to rebuild the wheels. 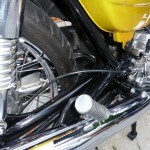 New old stock chrome air box covers were sourced. 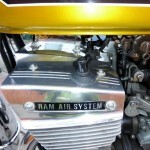 The engine cases and ram air covers were polished. All of the nuts and bolts were zinc plated. A really nice restored Suzuki GT380 Motorcycle. 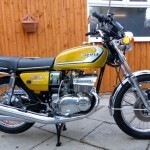 Suzuki GT380 – 1974 For Sale or Wanted? If you're looking for the perfect Suzuki GT380 – 1974 for sale then take a look at the hundreds of restored classic motorcycles listed on our extensive Motorcycles For Sale pages. 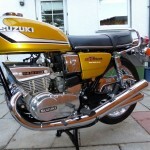 We regularly feature very nice restored Suzuki GT380 – 1974 bikes for sale. 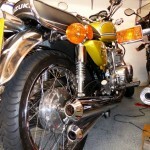 Spares and Parts for your Suzuki GT380 – 1974? Workshop Manual for your Suzuki GT380 – 1974? Want to leave a comment on this bike?